Thanks for hosting me, Anna. Starting with an easy question on the paranormal/fantasy angle, what got you writing the Sleepless City series in the first place? What are your influences there? I write what I love to read. I’ve read fantasy for years, including urban fantasy once it was available to read. When I was growing up there was a lot of science fiction, not much fantasy, and urban fantasy was unheard of. Now my reading is more fantasy/urban fantasy and there’s not as much science fiction in the mix, apart from audio books from Big Finish. Big Finish produces full cast Dr. Who audio as well as other cool stuff. Books about vampires and werewolves weren’t easy to get hold of either as there wasn’t much out there. I love Tanya Huff’s Blood series, and her more recent book, Silvered. I’ve also watched TV shows such as Forever Knight, Ultraviolet, and Moonlight. More recently I’m hooked on Teen Wolf and Bitten. Although not about vampires, Highlander was also an influence as it asked questions about what it was like to be immortal, and unchanging, at least on the outside, while everyone around you grew older and eventually died. I had a character who is a vampire—Simon Hawthorne—who had fallen in love with a photographer who was human. I’d written a few short stories for them, and had been debating writing at least one novel for a while but hadn’t got around to doing it yet. Elizabeth Noble and I were chatting one day and she mentioned she had a character who is a vampire that she wanted to do more with too. We figured why not combine our ideas, and so The Sleepless City was born. Although we had several main characters already, we tweaked them a bit to fit the shared universe, and then set to work out who and want we wanted for the other characters. Simon and Ben are mine, Forge and Blair are Elizabeth’s, and Lucas and Declan are shared characters. There was a lot of discussion about not just the mythology of the universe, but the plot. As the four books form a single story arc, we needed to know what was going to happen in book 4 before book 1 was written. I tend to write in series, and can’t write a one shot to save myself. Even my so-called stand alone stories morph into being a part of a wider universe. If they’re not part of a series, they’re like a prologue to one. One of the reasons I’m drawn to series is the bigger canvas. I have more room to explore characters and the world they inhabit. My writing is very character driven, with the stories I tell a glimpse of characters’ lives. Writing in series brings the chance to let them tell more of their story, as well as their history and background. I think it’s important to go into a series with an idea of where I want to go with it. Do I want to tell a finite story with each book being part of that ‘arc’? Or tell separate stories that take place in one universe? Most of the series I’ve written so far have a definite beginning, middle and end, but some of the new ones I’ll be starting when my current WIPs are finished will be the latter. For example The Sleepless City is a finite story told over four books, but the spinoff I will writing—Opus (https://annebarwell.wordpress.com/series/opus/)—will be ongoing, and telling different stories within that universe. Continuity is also important when writing a series. It’s one of the reasons I write my series in a ‘circle’—book 1 of series one, then book 1 of series two, then book 2 of series one etc. It’s easier to check continuity in previous books when I have a copy to flip through. I also have notebooks for every series I’m working on or planning to write. It takes time to do all the checking, but I think it’s worth it. I know you’ve co-written the series with Elizabeth Noble. What are the pros and cons of having a writing partner? Go on… dish the dirt! One of the things I enjoy about writing with a partner is having someone to bounce ideas off. We’ve had some animated discussions about our guys and their universe. It’s also surreal to read my characters being written by someone else, and to know that the story I started with Book 1—Shades of Sepia—of the series will be continued in part by someone else. Elizabeth and I have very different writing styles, and she writes faster than I do. Because of this, we had to have all books plotted out in far more detail than I normally would. We gave each other lists of stuff we wanted in each other’s books. They were specific points that needed to be set up for the next book, plus spoilers that had to be avoided. It wasn’t just plot that needed to be checked for continuity, but the characters too. Although we were writing each other’s characters, they needed to feel like the characters from the previous book, and sound the same to the reader who are following the series from beginning to end. Tell us something we don’t know about Lucas and Declan. What makes them tick, what attracts you to them to write their story? I’d tell you what Declan’s real name is, but then… it’s never a good idea to upset a vampire. In The Sleepless City universe vampires and werewolves have a long history of animosity. The truce they have now is an uneasy one, and it wouldn’t take much to upset it. Werewolves have been raised to mistrust vampires, and it takes a lot to go against societal expectations. One of the reasons I wanted to write Lucas and Declan’s story is that Lucas is a werewolf and Declan a vampire. Lucas, however, is an atypical werewolf in many ways, and has close friends who are vampires. It doesn’t go down well with his pack alpha—who also happens to be his father. While the previous books in the series were more focused on vampires, writing Lucas’s story, shifts—no pun intended—the story more onto werewolves. It gave me the opportunity to explore more about their society and by extension Lucas’s family. Having Declan’s perspective in there too gave an outside view of both of those. Declan has known the Supernatural Council for many years, and knew Lucas’s father when he was a boy. 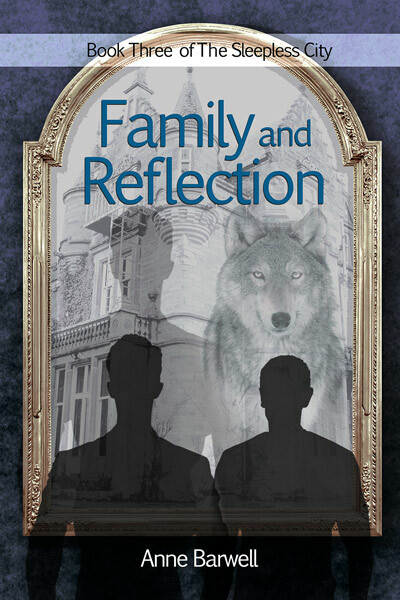 Declan has been a vampire for nearly two hundred and sixty years, so his view of life is a little different from that of the younger characters. One of the reasons he enjoys a good con is the challenge that goes with it. Perish the thought he might start getting bored, although I doubt that will happen with Lucas in his life. I’ll link to IMDB rather than share pictures because of copyright, but the ‘casting’ process was something Elizabeth and I did very early on in the planning of this series. With both of us writing each other’s characters it was important we were on the same page with descriptions etc. I loved him in The Librarian movies, and series, and in ER. He has that wonderful mix of brilliance and geek. I still need to play catch up with watching Falling Skies. I blame Grimm for this choice. Every time I see him in that I think hmm, that’s Declan. He’s got the height, build, and presence for Declan, not to mention the looks. I’d like to explore more of The Supernatural Council and its members. They’re an interesting mix of personalities and species. There are hints of their histories in this series, but I’m planning to learn more about them as individuals and the inner working of the council in my spin off series Opus. In Shades of Sepia, Ben keeps in contact with his friend Ange in New Zealand. In Family and Reflection she comes to Flint to visit him, and there’s a small but interesting reveal about her character. It was fun having someone in the mix who isn’t a supernatural or soul bonded to one. Ange is going to be one of the characters in Outliers, a series about guys with psi powers, set in Wellington, which I want to write. I’m looking forward to exploring more about her in that. What was one of the most surprising things you’ve learned in writing your books?The differences between living in the US and NZ continuously surprises me. It’s the little things I don’t think of. One example is if there’s a gunshot here everyone presumes it’s a car backfiring and doesn’t pay any attention until the Armed Offenders Squad turns up. Another is that using creamer in coffee and tea isn’t common here. We prefer milk. The differences in slang I expected. When Ange mentions finding a park, she’s talking about a parking spot. We wouldn’t say parking spot here. I’m happy with the novel itself but if I could have a do-over, I’d try not to have such a tight writing deadline. But as the saying goes hindsight is 20/20 and I had no way of knowing that last year would bring with it major family health issues although everything worked out in the end. Previous Finding Flynn. At last. Thanks for interviewing me, Anna. Interesting questions that really made me think! It’s great to have you here, Anne. Every best wish with the release!